Do you love the sweet and salty combination of chocolate popcorn as much as I do? My family has always loved a late night popcorn snack. Dad and I would make a date to enjoy some well buttered and salted mouthwatering popcorn together. I still enjoy the old standby traditional popcorn, but I have to admit that there is just something pretty awesome about chocolate covered popcorn. This delightful snack adds new meaning to the word "delicious." One of the finest popcorn suppliers I've found is Dale & Thomas Popcorn. I admit that I have a hard time even looking at the pictures of the different chocolate popcorn varieties on their site without breaking down and ordering myself some. I enjoyed treating my wonderful parents to Dale and Thomas gourmet popcorn and they adored it. But, if you want, you can just make some of your own. 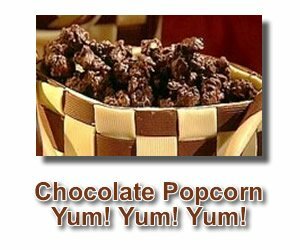 Check out some of these chocolate covered popcorn recipes and prepare some for yourself or your family and friends. 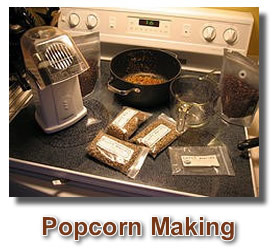 It doesn't really matter if you make the popcorn in a hot air popper or on the stove top. Obviously, the hot air popper is a lot easier and you don't have to watch it too closely to keep it from burning. Most hot air popcorn makers come with an instruction sheet, but even if they don't it's as easy as 1-2-3. Place about 1/4 cup of popcorn kernels in the bottom of the popper and place the lid on top and a bowl under the opening to catch the popped corn. If you're going to use your air popped corn for making chocolate covered popcorn, you don't really need to salt and butter it at this point. If you just want buttered popcorn, though, now is the time! Be sure to use a LARGE pot. :) I tend to get into trouble because I don't always use a big enough pot. It gets a bit dicey when it is popping away and overflowing! When the "test" kernels pop you know the oil is hot enough. Add the rest of the kernels and put the lid back on. I like to give the pot a bit of a wiggle every minute or so, just to stir the kernels and reduce the chances of burning. The popping should start coming pretty fast and furious for a bit. When it slows down, be careful. This is when you are about done and the burning starts. Don't expect all kernels to pop. Learn from my experience! If you wait for that to happen, you WILL burn your popcorn. Pour popped corn into a large bowl. If you are making one of those wonderful chocolate popcorn recipes listed above, spray the bowl (or roasting pan if directed) with cooking spray. This will help to keep the coating from sticking to the bowl or pan. That's it! What could be simpler? Just remember - SHARE! I hope you fall in love with chocolate popcorn as much as I have. Enjoy.